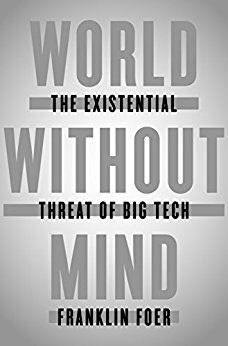 Franklin Foer, author of World without Mind, does not like Google, Apple, Facebook or Amazon. He’s not alone — many people, me included, are nervous about the pervasive influence of these tech giants. But he has a special gripe, losing his editor job at The New Republic courtesy of the digital revolution that reshaped consumer expectations toward “free” content, gradually, insidiously transforming journalism into clickbait writing designed to get views and feed the marketing beast. Foer clearly states that he hopes the book rises above his personal anger. It doesn’t, and I almost gave up on it. That happens often enough — not every book can be a winner for every reader — but my rule is that if I don’t finish a book, I don’t review it. And parts of the book irritated me enough that I wanted to be able to review it. I wanted to like this book, but I found it burdened with incomplete and often contradictory “arguments” against a too easy target. He seems to simultaneously blame the big four — often called GAFA — for intentionally doing evil, but then focused on roots stretching back to the days of hippies, those cosmic do-gooders. He chastises the government for not standing up to GAFA with monopoly busting rigor, but lets consumers (and voters) off the hook for enabling this slide deeper into technocracy and corporate oligarchy. He seems to praise the recent past as the apex of social evolution, especially for writers, journalists and publishers, but glosses over the many, many imperfections and inequities that characterized those ostensibly halcyon days. Imagine a book that earnestly takes issue with digital movies — Apple TV and Netflix and Hulu — and positions them as part of an evil empire that gives too much power to lazy consumers, undermines Hollywood executives (those noble tastemakers and creative geniuses laboring to meet artistic ideals) while bemoaning the loss of jobs suffered by altruistic video stores and movie theaters. And then imagine the author is the former head of a prestigious studio now upset the Netflix has taken over his domain. The GAFA companies are unquestionably changing the way we access content, verify facts, sell things and stay connected. But our society only understands the headlong rush forward, and we currently only have one system, consumer-based capitalism, to determine the pace of acceptable change. GAFA is leveraging and exploiting that, perhaps more ruthlessly and effectively than ever before, but it won’t last. Nothing lasts. Rome didn’t last. Cassette tapes didn’t last. Pokemon Go didn’t last. Horse drawn carriages and steam engines didn’t last, nor will automobiles, or GAFA. That’s not to say we shouldn’t be looking closely at GAFA, and regulating them appropriately. Google is subtly and not-so-subtly influencing the search for and acquisition of knowledge using algorithm alchemy we can’t understand (and stalking us! ), Apple is changing the way we interact with each other and not to the better, Facebook, perhaps inadvertently, skewed the recent election in the US, and Amazon has completely disrupted the publishing industry and retail. But GAFA is enabled by people, all of us, taking the path of least resistance. We need to have a real conversation about why we do that, and why we have a society in which efficiency and profit shape everything. If we can solve that riddle, GAFA loses the power we give them. WE give them. We give them this power by continuing to elect a government that exists to support corporate interests. I don’t think Google, Amazon, Facebook, and Apple are necessarily bad, as this book makes them out to be, I just think they are given free rein by a system that can only judge worthiness by efficiency and profits, and that system is enabled by elected officials who value donors over constituents, and those elected officials are the result of a mostly apathetic voting public willing to trade away their freedoms and privacy for entertainment and convenience. And so the beast eats itself. And we are the beast. As I mentioned, I finished it so I could give it only a lukewarm recommendation. I wanted to like it more; it’s not a bad book and he’s a very talented writer tackling an important topic, but it never quite rises above his personal sense of outrage that he was so easily displaced by a society that doesn’t care about his expertise. At one point, Foer says, “Somehow, in each instance, humanity remains its familiar self.” So why, then does he expect humanity to magically solve huge, complex issues such as these when we’ve never done it before? That’s what I hoped I would learn. Instead, the key takeaway for me was that, like work emails, you should never write a book — or probably a book review — when you’re mad. And the thing that made me the maddest? Dissing on The New Yorker. It was petty and misplaced. I don’t “gaudily unfurl” it on the subway “as a totem” of my “cosmopolitan and literary bent.” I read it on my iPad in bed because I value the quality of the writing and the depth of the journalistic expertise. They embraced the digital age without sacrificing their strengths. Other magazines could take a lesson. Hint hint.